I am including the defensive ends they have, as their front has a very 3-4 look to it. BJ Hill and Dalvin Tomlinson moved to their more natural positions after the Damon Harrison trade during the 2018 season. Both are solid players but it can be debated neither are a true fit for the nose tackle spot. Tomlinson is penciled in there for now but he is more of a penetrator that struggled to be stout over his first 2 years. Pierre Olsen was signed from ARI and he will compete for the starting 5-tech spot with RJ McIntosh, a high upside player that got his feet wet towards the end of last yea after missing a lot of time with a sickness. The group is thin and it looks like they will be bringing in more veteran talent before training camp. Summary: Third year sophomore entry. Was off the radar entering 2018, as his impact as a redshirt freshman in 2017 wasn’t until late in the year. When it comes to his play on the field, Williams helped his stock as much as any player in the class. 2018 All American. He was a dominant force week after week, the standout defender on a loaded Alabama defense. Williams is a tough assignment to block because he can alter his approach snap to snap. It is hard to find such elite levels of play across multiple styles. The speed-to-power will immediately become one of the best in the league. A scheme that will let him penetrate through different lanes and angles will benefit from Williams in a way where their entire defense will be elevated. He is a big time difference maker right away. *It is possible Williams falls right in to the waiting arms of NYG at 6 if the teams ahead of them are pursuing more edge presence and someone grabs a QB. While his size isn’t anything to write home about, Williams would be an ideal fir for the NT in Bettcher’s scheme. He is all about penetration via power and speed but can more than hold his own against double teams in the running game. He still has some growing to do and when all is said and done, I think he has a strong chance at being the best player in this class. Summary: Junior entry. A blue chip recruit that made an impact right away, winning the ACC Freshman of the Year Award in 2016. He then went on to earn two straight 1st Team All ACC placements even though his production wasn’t anything noteworthy. Lawrence can be a missing piece to a defense that struggles against the run. His mere presence demands attention from multiple bodies and he is no slouch when it comes to pursuing the ball. Even though he is almost always the biggest and most powerful player on the field, Lawrence needs to shore up techniques and be more consistent. He is not an every down player, but certainly one that can dominate in stretches. *If there is one non-QB I think NYG may be looking at with their 17th pick, it’s Lawrence. He fits the bill with what Gettleman wants up front and the trade of Harrison left that NT role wide open. Lawrence was the piece that made that loaded Clemson front go. I can remember seeing him play as a true freshman and at that moment in time, I said he was ready for the NFL. There is a rare combination of size, speed, and power to go along with more awareness and intelligence than you may think. Big time potential here that can change a defense right away. Summary: One of the best defenders in Clemson history that has been a dominant force since 2015, where he was a Freshman All American. The three time All-American and two time Nagurski Award finalist was moved around the defensive line over the years but what never changed was his impact on the game. The sheer volume of plays made from the trenches over the years is incredibly rare. The coach’s favorite, when all is said and done, can be put anywhere along the line and it is as close to a guarantee as it gets that he will produce. He is a winning football player that makes others better and will be a defensive coordinators favorite, most versatile toy. *My initial grade on Wilkins was one of the top 2 overall grades in the entire class. I have a thing for this kid and while I will stick to my board when draft time rolls around, I’d be ecstatic if he ended up in blue. And you know what? His best role in college was at the 5-technique and that is the gaping hole on this defensive line. While further scouting exposed some power-deficiencies, Wilkins is a true gamer that will wear several hats for a defense. A scheme that likes to switch things up and move guys around, Wilkins can be a stud. Top notch kid and a true culture-builder. Summary: Junior entry. The only three-time All American in school history. Chose Houston over top tier programs out of high school. An ultra-productive player that has been one of the most explosive, dangerous defensive linemen in the country since he stepped on the field. Elite, rare-level speed and quickness for the position that can impact the game in ways that very few can at any defensive position. An ideal 3-technique from a speed and burst perspective that will need to improve his staying-power and stay-at-home defense so he isn’t a one-trick pony. Elite ceiling but carries plenty of risk as well. *One of the more polarizing prospects in the class. Part of me wants to throw all of my chips in the middle of the table for Oliver because I have never seen a DT move like him, ever. The other part of me says he won’t be able to handle NFL lineman and there just isn’t enough discipline in his game. At the end of the day, whichever team drafts him needs a very specific plan for him. You need to get him moving laterally, alter his pre-snap positions, and let him pursue. Houston mis-used him in 2018 and showed the world he can’t just live inside and bull rush. The explosion and quickness can be a weapon, but there is more to it than just that. Does he fit with NYG? I’m not sure because I don’t think Bettcher has ever used a guy like this. But there is no denying the upside to impact this defense, and this league, in a big way. Summary: Fourth year junior entry. After a couple years of promising flashes, Jones broke out in 2018 with a 1st Team All Big 10 performance that included 8.5 sacks and 13 TFL. Jones is a standout athlete that can be moved around the defensive line. His size and athleticism can cause matchup problems for any blocker depending on the situation. He has some work to do on his strength/power game, but the tools and skill sets are there. If he continues to stay on his current trajectory as a versatile inside defender, Jones has the upside of a Pro-Bowl caliber player. *There is something about Jones that makes me think NYG is going to go after him at #17 if the chips fall their way. He is a true fit for the 5 technique spot, one that will add a big time pass rush presence to a front that is starving for sacks. Jones is arguably the most efficient and prolific mover in this group when it comes to short areas and technique. His frame can handle more weight and in time he could be one of those rare 3-4 DL that grabs 8-10 sacks a year. Summary: A former high school offensive tackle that was highly touted on that side of the ball, Tillery made the move to the defensive side right away at Notre Dame. After some questionable character hiccups early in his career, he grew up and molded himself in to a fine and potentially elite prospect. Tillery is a really unique blend of tools and skills that don’t come around often, plain and simple. He finished his career as an All American, causing plenty of disruption as a pass rusher, run defender, and on special teams. He is the kind of defender that can simply beat quality offensive linemen even when they do everything right because he has such a physical advantage. The path he has been on since the start of 2017 and the progression he has shown is on the path to stardom. *Occasionally I will get nervous about defensive tackles that are this tall, as they just have such a hard time with leverage battles. Not Tillery. He plays low, strong, and fast. What he has become over the past 2-3 years makes me think this kid is going to be one of the draft-weekend bargains. He flashed stretches of sheer dominance via power and athletic ability multiple times and while I wish he was more consistent, he has “pro” written all over him. Another good locker room presence kid that will be in the league a long time and offer big time upside. Summary: Fifth year senior. 2018 was the only season where he was a full time starter and it ended in him earning Honorable Mention All Pac 12 honors. Wren was moved around the line early in his career, but he settled in at the nose tackle in 2018 where his elite power and reach was a difference maker in the middle of their line. Wren was a fun player to watch because of how much he imposed his will and presence on centers. I almost felt bad for a few of his opponents, as it just looked unfair. Wren won’t be a pass rusher early in his career, but any team that wants consistent presence along the inside will want this guy. High upside pick because of his naturally dominant traits. *If you watch Dexter Lawrence play and fall in love with the push he gets at the point of attack, you almost have to like Wren and what he brings to the table. He finally found his home at nose tackle in 2018 after being moved around too much early in his career. Wren won’t be an every down player but he is the kind of guy you want on your side when you need to stop the run. He demands a lot of attention and he was arguably the most consistent force at the point of attack when it came to sheer movement and presence I saw all year. Summary: Fifth year senior that began his career at Florida. After a few run-ins with the coaching staff, Willis was kicked out of the Gators program and landed at Miami. After more personal issues in 2017 that kept him on the scout team, he came back on fire as a fifth year senior and put together an All American season. Willis is a three technique that has shown more than enough ability and potential. He is a true disruptor that makes the offensive line adjust to him, not the other way around. If he can stay clean and drama free, he is some simple development away from being a dangerous force. *There will be extra screening needed here, as Willis has had multiple issues off the field and his coachability has been questioned. That said, the performance he put together in 2018 was, no doubt, 1st round caliber. This is the kind of player that can change a defensive front right away. I do think his best role is a 3 technique where he can shoot gaps and disrupt, but there is more to his game than just that. One of the wildcards of this entire class. Summary: Junior entry. Two time 1st Team All SEC and a 2018 All American. Simmons was soaring his way in to round 1 territory in the eyes of some but a torn ACL while training for the combine grays his 2018 in a big way. In addition he had an arrest a few years ago that included violence against a woman, something the NFL as a whole has really tried to come down on. While that won’t impact his playing status in the pros, it is noteworthy. On the field, Simmons is a really impressive specimen. He has plenty of straight line speed and a body that makes scouts drool. However I see a lot of issues in his game, most notably reaction-based quickness and leg stiffness. Throw in the injury and I just don’t see him where others do although I think someone will gamble on the upside early day 2. *The ACL injury is part of the grade but even then, I had him as a borderline first round talent leaning towards the top of round 2. I like Simmons and his athletic-freakness, but I never saw the elite player that some are talking about. I see too much stiffness and a lack of leverage that can eat a player up in the NFL. The off field stuff from years ago really isn’t a part of the equation for me. Simmons is a slid 3 technique prospect that likely won’t factor much in 2019 until late in the year. I would rather someone else take the chance on him. Summary: Former junior college player that was a major get for the program prior to 2017. A two year starter that has been a steady pass rush presence from inside the tackles, as he led the team with 9.5 sacks in 2018. 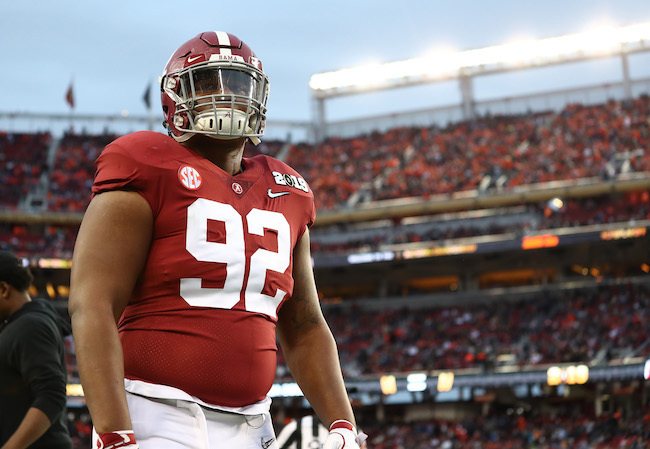 While Buggs won’t impress many with tools, he may be the most technique-savvy and smartest player along the ‘Bama front. The coaching staff loves how he takes things in and applies them to games and that stood out to me. Buggs is a safe, reliable player that won’t be a star but I bet he has a 10-year career. *One of my favorite day 3 targets here, not because I think he will blossom in to a star, but because I think he will be Mr. Reliable for a long time. I actually think he has Patriots written all over him. Buggs can fit in nicely to multiple inside roles and I don’t see his physical shortcomings being an issue with his style of play. *For a team that is looking strictly for a two down run stuffer, Mack’s grade can certainly be moved in to day 2 territory. He has the kind of body that simply won’t be moved by single and double teams alike. I’m not quite sure what his deal was in 2016 and 2017, but the 2018 version of him showed flashes of dominance. He might be a guy that you need to keep in check with his diet and work ethic, but there will be a starting role for him somewhere. Summary: Three year starter that progressed well over his career. Finished as the team’s 2018 sack leader. Keke is a really twitchy athlete with the length and easy bend that can give interior blockers a fit in pass protection. He is inconsistent, a lot of disappearing for stretches but when he plays to his upside, he can wreck a game. He will need time to develop his body but he has solid rotational pass rusher written all over him. *His best fit is likely in a 4-3 scheme we he can shoot gaps and use the quick footed, long-armed frame to his full advantage. He can’t be trusted as an every down run defender but there is enough he can do against the pass to warrant a highly-used spot. May have to wait a year or two for him though, he needs body work. Summary: Fifth year senior. Three year starter that has been one of the staples of Washington defense for years. He was All Pac-12 all four seasons, ending his career on the 1st Team. Gaines primary role at the next level will be inside gap run stuffer. He can control two at a time and demand attention. But he proved he can’t be slept on from a playmaking perspective. For a player that doesn’t exactly specialize in burst and movement, he makes a lot of plays away from the starting point. He is as blue collar as it gets and will be a safe bet to provide solid 2 down run defense. *Similar to Mack above, there are some teams that may have a day 2 grade on Gaines based on the need for more run defending presence. He is a rock in the middle that plays hard and smart. A really reliable, yet limited, player that NYG may want to give a hard look to on day 3 if they want a NT presence that brings something different to the table than Tomlinson. Summary: After a really quiet career leading up to 2018, Watts broke out and led the Razorbacks with 7 sacks and 3 forced fumbles. He is still a bit of an unknown but its hard not to be drawn to him when re-watching his tape. He has a lot going for him when it comes to size and power. There are some red flags from earlier in his career when it comes to attitude and effort, but this kid took a turn this past yea off and on the field. Someone may be getting a huge bargain on day 3. *Big, mean, physical and quietly very skilled. Watts has the look of a kid that enters training camp and starts tossing veterans around and wrecking havoc. Where he was for the first three years is a little unknown besides the fact that he didn’t work hard, but something seems to have changed and 2018 was a glimpse of what this kid might be in the NFL. Summary: Fifth year senior. After playing three years at Illinois where he never quite stood out, Odenigbo transferred to Miami for the 2018 season and started to shine as the year progressed. After breaking his way in to more playing time, Odenigbo finished the year with 5 TFL over the final 5 games. His quick and easy power comes natural and the pad level he can play with generates even more effort for blockers to put out. Odenigbo is a but of an unknown by the flashed some really solid traits and should be drafted. *Maybe my top sleeper along the DT group. If it weren’t for a few character red flags, I may have had him closer to the 4th round area despite a lack of experience in college. Odenigbo really showed me something when he got in to the steady rotation and I think there are NFL traits here that most schemes could use. There are a couple of really interesting prospects on the North Texas squad, but Young is a guy that flashed over and over. For those that fell in love with Khalen Saunders at the Senior Bowl, Young has to get some attention from you. Similar frame, similar style of play, and comes with a little more mobility. I think Young can be a solid addition to stash on the practice squad for a year or two and watch him blossom in to a disruptive nose tackle. The more you look at this depth chart, the harder it hits you that this team has holes everywhere. The defensive line, when it comes to the demands of a 3-4 scheme, is just fine when you look at the starting trio and like I said earlier, I think one more free agent will be signed in the coming weeks. However the depth, should someone go down, just isn’t there. I was a believer in McIntosh when they drafted him a year ago but the sickness he went through really put a hitch in his needed physical progression. At the top, I am not sold on Tomlinson being a guy that you overlook a really solid NT prospect should someone be there in the first. I think the odds are that NYG will be pursuing an interior force with one of their first 3 picks.